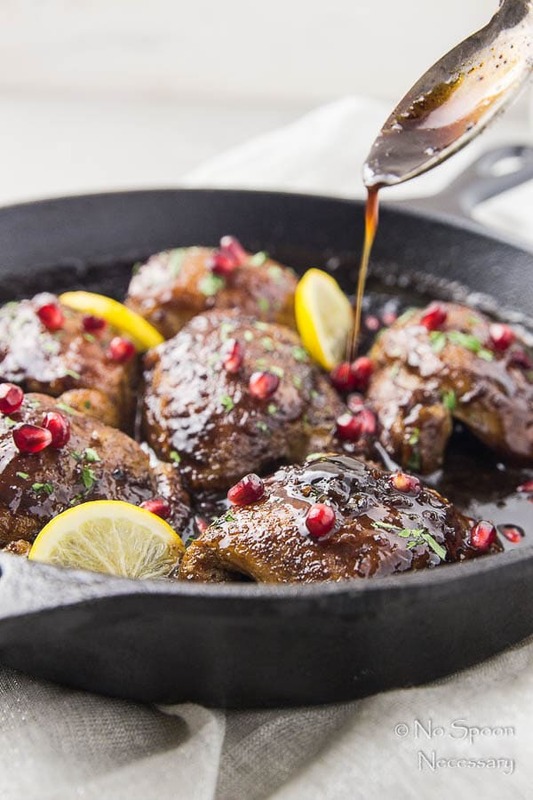 Tender, golden brown chicken thighs smothered in a smooth, sweet and tart honey-pomegranate sauce. 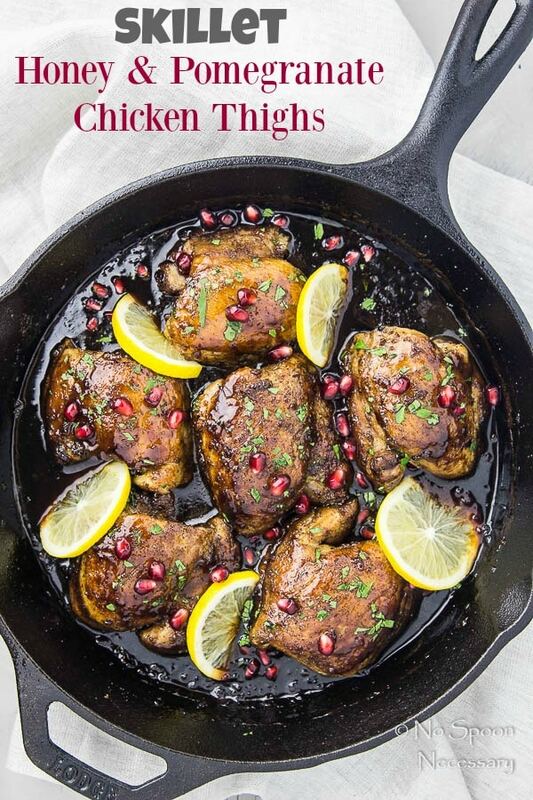 These Skillet Honey Pomegranate Chicken Thighs require minimal ingredients and effort, making this dish perfect for entertaining or easy, weeknight meals! Hi there, friends!! How was your Thanksgiving?? Or, if you live outside of the United States, how was your last weekend of November? Please tell me you ate entirely too much… you know, in that joyous, food coma and it feels so good kind of way? My Thanksgiving weekend was A-Okay. Instead of going out to dinner for Turkey day, I actually ended up cooking dinner for Boy and I. ⬅️ His idea, not mine. Since the at home dinner decision was preeeeeetty last minute, I didn’t bust out all the stops and make an over-the-top meal. I kept it simple with an easy-peasy slow cooker herb turkey breast, maple brussels sprouts, mashed potatoes (for Boy) and cauliflower mash (for me). Other than the impromptu Thanksgiving dinner for two, our weekend contained lots of pajama-time for me… low-key life up in the SBCC (SuBourbon Country Cottage). Anyways, enough Thanksgiving weekend talk, we are going to keep it moving because I know your time is precious this time of year. I’m 99.8765% sure most of you guys need a break from cooking right now. I mean, sure you NEED to EAT, but preparing elaborate meals that take longer than 30 minutes are OUT. 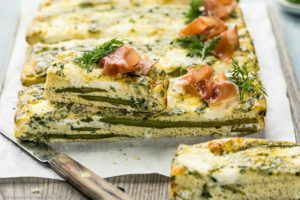 And, easy-peasy, delicious, one pan meals are IN. 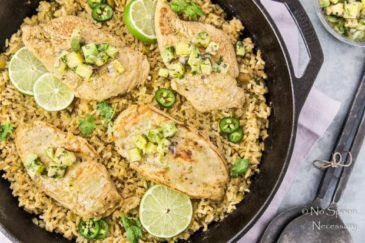 Simple, fresh ingredients + minimal effort = winner, winner easy weeknight chicken dinner. BUT, this chicken also has got it goin’ on in the looks department. 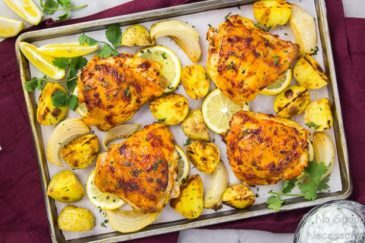 So, if you are having company over and you need an easy, yet elegant dish, look no further than these chicken thighs right here. 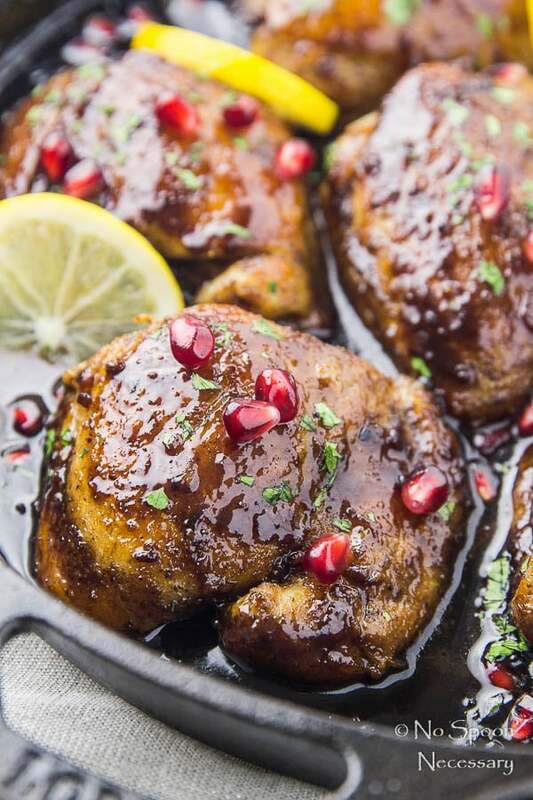 Juicy, tender, succulent, golden brown chicken thighs smothered in a smooth, slightly sweet, tad tart, savory honey-pomegranate sauce. Garnished with herbaceous parsley, pops of jeweled pomegranates and a punch of acidic lemon, this chicken is my new OBSESSION. 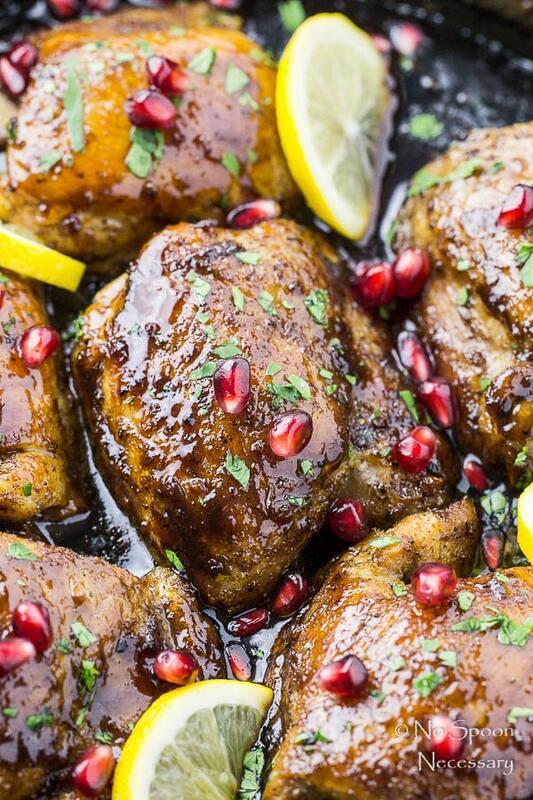 Jam packed with flavor and easy-breezy to make, these chicken thighs NEED to grace your table. 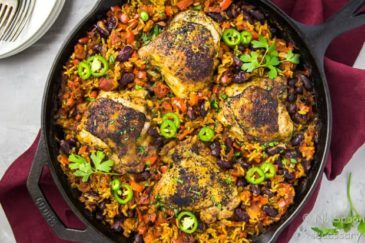 If you have a cast iron skillet, now is the time to use it. Cast iron pans sear food like a champ, and their even heat level is the thing skillet dreams are made of. Just trust me on this and bust out the cast iron skillet… mmm ‘kay? My chicken thighs were big-ole-mama-jammas, so I needed to finish cooking them in a 350 degree F oven for a beat (about 7 minutes). This is also where the cast iron skillet comes in handy, since it can go from stove top to oven without worry. A note on #2. If your chicken thighs are large as well, and they are golden brown from the pan-sear, but not cooked through, DON’T worry. Simply follow the instructions and remove them to a plate after browning. Then preheat your oven to 350 degrees F. Continue with the recipe as instructed, adding the shallots and making the sauce. When you add the chicken back to the pan, turn it to coat and transfer the entire skillet to the preheated oven. Let it finish cooking in the oven until the chicken has reached an internal temperature of 165 degrees F.
I used boneless-skinless chicken thighs, but you can absolutely use bone-in, skin on chicken thighs, you will just need to finish cooking them in the oven, following the note instructions above. 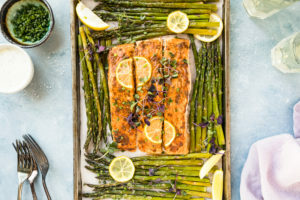 You can also substitute boneless-skinless chicken breasts, if white meat is your jam. Use whatever chicken floats your boat, friends! This recipe calls for Pomegranate Molasses, which is MUCH easier to find now than it was a year ago. My regular (non-specialty) grocery store carries it in the ethnic isle. To complete this meal, I served my chicken thighs with jasmine rice, but plain white rice, sticky rice, couscous, mashed potatoes, cauliflower mash, or just roasted vegetables would also be great! 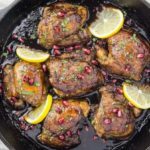 Whether you are entertaining friends and family this holiday season, or just trying to get dinner on the dang table, these Skillet Honey Pomegranate Chicken Thighs are for YOU! 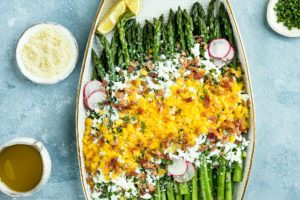 Until Thursday friends, Cheers – to sanity saving skillet chicken. 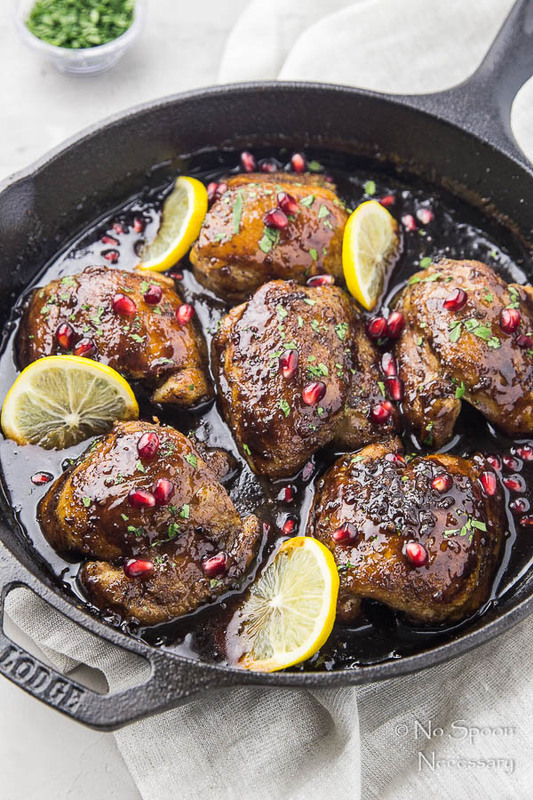 Tender, golden brown chicken thighs smothered in a smooth, sweet and tart honey-pomegranate sauce. 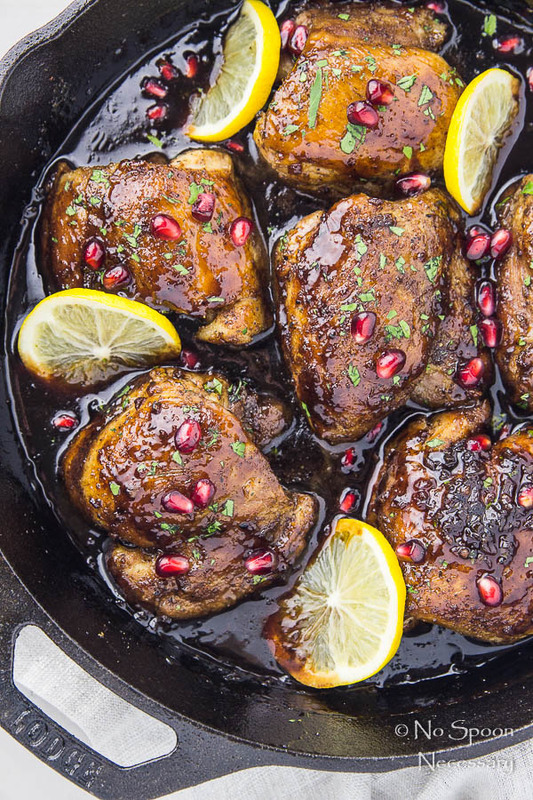 These Skillet Honey & Pomegranate Chicken Thighs require minimal ingredients and effort, making this dish perfect for entertaining or easy, weeknight meals! In a small bowl combine: salt, cumin, pepper, ginger and chili powder. Rub seasoning onto chicken thighs. In a medium bowl or measuring glass mix together: molasses, pomegranate juice, honey, vinegar and lemon. Set aside. Heat oil in a large (cast iron) skillet over medium heat. Add chicken to skillet (in 2 batches if needed to not over-crowd the pan) and cook until golden brown and cooked through*, about 4-6 minutes per side. 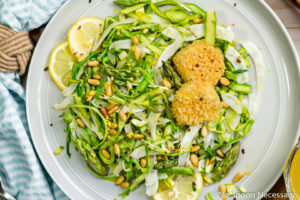 Remove chicken to a plate and set aside. Add shallot to the skillet and cook until softened, about 3 minutes. Meanwhile, combine the cornstarch with 1 tablespoon of water and whisk to combine. Set aside. Add garlic to the skillet and cook until fragrant, about 30 seconds. Add the molasses mixture and bring to a rapid simmer. Add in the cornstarch/water mixture and whisk to fully incorporate. Reduce heat to medium-low and simmer the sauce, stirring occasionally, for 3-4 minutes or until thickened. 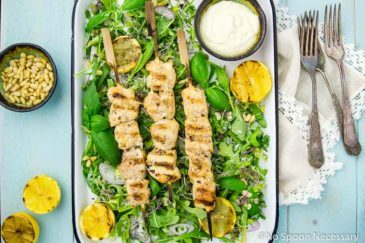 To serve: Garnish with parsley, pomegranate arils and slices of lemon. Serve and enjoy! 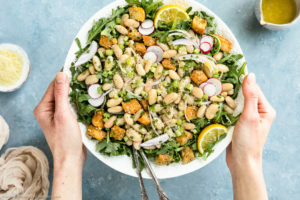 *You can substitute boneless, skinless chicken breasts or bone-in, skin-on chicken thighs. 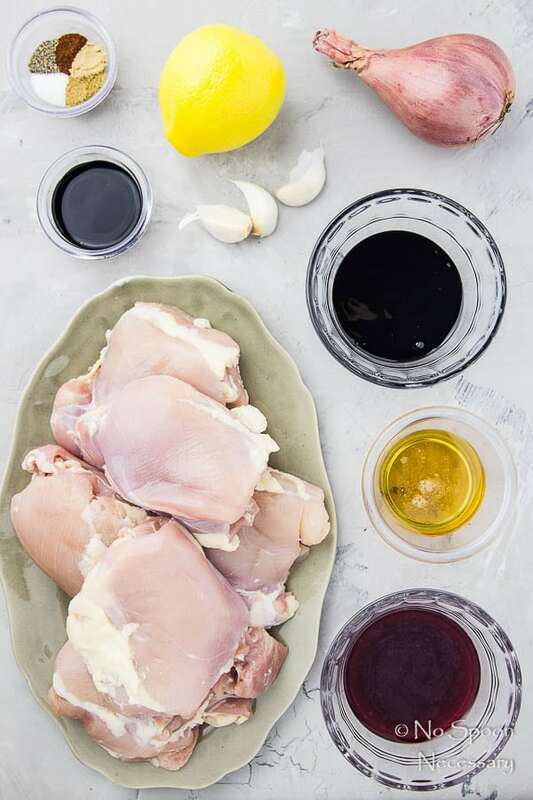 If using bone-in, skin-on chicken thighs, you will need to finish cooking the chicken in the oven. Follow the instructions in the note below. *If your chicken thighs are large, and they are golden brown from the pan-sear, but not cooked through, DON’T worry. Simply follow the instructions and remove them to a plate after browning. Then preheat your oven to 350 degrees F. Continue with the recipe as instructed, adding the shallots and making the sauce. When you add the chicken back to the pan, turn it to coat and transfer the entire skillet to the preheated oven. Let it finish cooking in the oven until the chicken has reached an internal temperature of 165 degrees. Hi! 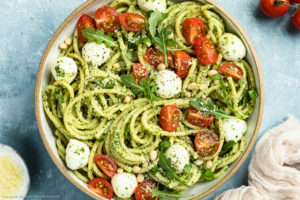 This looks yummy 🙂 Can the pomegranate juice be substituted with something else? Thank you for the kind comment! Cranberry juice is a pretty close substitute. 🙂 Cheers and thank you for stopping by!